Home / Fish / An Orangefin Powder Brown Tang? At first glance, this curious specimen looks quite a bit like the Powder Blue X Goldrim Tang hybrids that show up regularly from places like Christmas Island and Bali, but, despite its faintly blue coloration and bright orange fins, we can be reasonably sure that this isn’t what we’re looking at here. 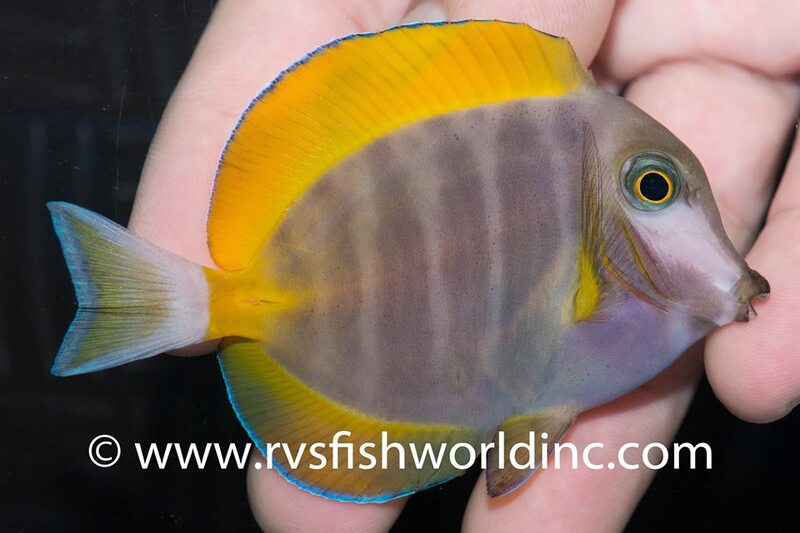 This fish was discovered by the collectors at RVS Fishworld’s new outpost on Lubang, Philippines and was initially identified as a Powder Blue X Powder Brown hybrid, but that isn’t correct either. 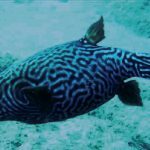 So what is this fish? This is an instance where knowing the provenance of a specimen greatly aids in identification. The Powder Blue Tang (Acanthurus leucosternon) is primarily an Indian Ocean species, straying only as far east as Bali and Komodo, and so we shouldn’t expect to find it swimming anywhere near a Filipino reef. Instead, this aberrant specimen appears to be a hypomelanistic variant of one of the Pacific species. 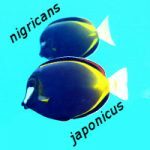 Both A. japonicus, the Powder Brown Tang, and A. nigricans, the Goldrim Tang, occur in Lubang, and both are plausible identifications for this individual. The differences between these two taxa are slight and relate mostly to the amount of black covering the caudal fin and peduncle and the white facial marking. 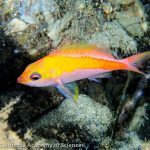 However, once we remove this overlying layer of pigment, as has been helpfully done for us with our specimen from Lubang, it’s likely that these two fishes would appear virtually identical. One consistent difference, however, might be seen in the caudal fin, which has a submarginal yellow band in A. nigricans and a more widespread yellow and black marking in A. japonicus. 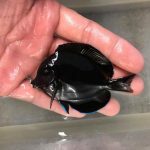 Remove the black coloration, and we’d likely be left with a diffuse yellow caudal fin, much like what we see with our specimen. 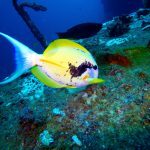 So, with some reasonable certainty, we can probably go ahead and call this guy a hypomelanistic Powder Brown Tang… perhaps the first ever to be documented.